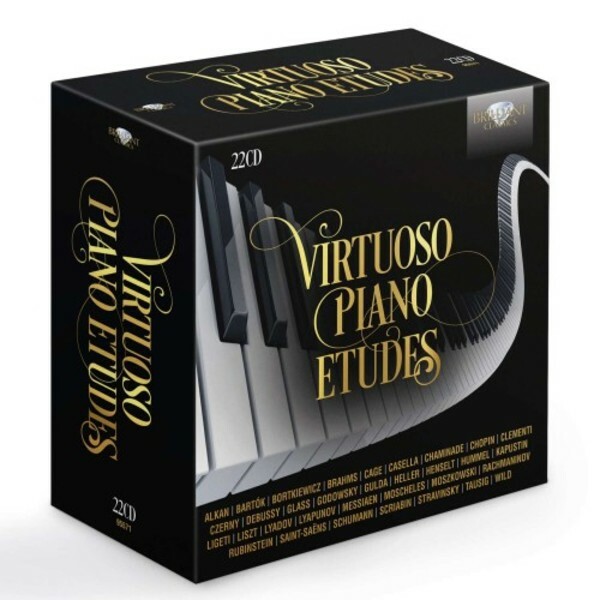 This monumental set dedicated to the Virtuoso Piano Étude offers a rewarding opportunity to witness two centuries in the evolution of masterpieces for the study of the piano. Composers have been challenging pianists with études for a long time. The practice of writing studies for the perfection of a particular pianistic technique developed in the 15th century, but the name ‘study’ or ‘étude’ only really came into its own in the 19th century with the rise in popularity of the piano as a domestic instrument. Works of particular importance were Clementi’s Gradus ad Parnassum, Moscheles’s Opus 70 Studies, Czerny’s Art of Finger Dexterity and Liszt’s Transcendental Studies, the latter even more extensive and complex than Chopin’s Études Opp. 10 and 25, which transformed the humble piano exercise into concert-worthy material. While each of Liszt’s and Chopin’s études examines a particular aspect of technique, these magnificent works never feel like drills. They remain amongst the most popular works written for piano, regularly recorded and performed in concert. In the 20th century, studies gradually evolved into compositions that were music first, only secondarily exploiting a specific technical challenge for the pianist. Notable composers were Claude Debussy, Sergei Rachmaninov, Alexander Scriabin and Leopold Godowsky. Godowsky’s Chopin Studies push fingers and feet, mind and imagination, physicality and finesse, fitness, to the outer limits of possibility. By mid-century composers had almost completely abandoned the old tradition. Olivier Messiaen’s 4 Études de rhythme are not didactic compositions but experiments with dynamics, figurations, pitches, etc. – exercises in composition rather than performance. Friedrich Gulda intended his Play Piano Play as exercises in learning the jazz style and improvisation, contrasting traditional neo-Baroque with various jazz traditions. Philip Glass abandoned bar lines to convey his concept of the flow of rhythm, and John Cage’s Études Boreales, initially deemed unplayable because of the wholly unorthodox techniques they explore, require the performer to play, beat or generate sound on various parts of the instrument. These studies represent some of the most innovative and imaginative writing in the modern and contemporary piano repertoire, exploring to the fullest extent what the instrument is capable of.